Frank Capra’s screwball fairy tale — which swept all of that year’s five major Oscars — is, as Peary notes, a “super” film with many special “small moments” (who can forget the “Walls of Jericho”, or Gable and Colbert trading hitchhiking tips?). Unlike most of Capra’s later work, IHON is decidedly un-preachy; while it offers astute observations on issues of class and gender, none of these “lessons” are hammered over our heads. Colbert was reportedly unhappy with being cast in the film, but her implicit disdain works well for her character; and Gable — with his wisecracking, cynical demeanor — is perfectly cast as the tippling reporter who finds himself falling for Ellie despite his better judgment. 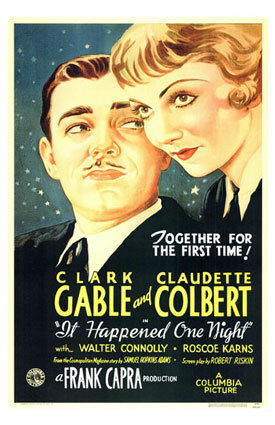 A personal favorite of many, It Happened One Night is certainly must see viewing for all film fanatics. Yes. This classic romantic comedy has held up remarkably well, and should be seen by every film fanatic. Nominated by Peary as one of the Best Pictures of the Year in his Alternate Oscars book (though he ultimately chooses The Scarlett Empress instead). Having just seen this again after (probably) much too long a time, I’m (I’ll admit it) smitten. To a degree. Certainly enough for it to be a must. Colbert: I don’t know very much about him…except that I love him. Colbert: No, it’s no use. He despises me. Colbert: Yes, he does. He despises everything about me. He says that I’m spoiled and selfish and pampered and thoroughly insincere. Colbert: He doesn’t think so much of you either. Colbert: And he blames you for everything that’s wrong with me. He says you raised me stupidly. Connolly: Now that’s a fine man to fall in love with. Gable: Yes! But don’t hold that against me; I’m a little screwy myself! Though I still can’t say ‘IHON’ is among my favorite films, there are two sequences that have me roaring: in the first, C (complete with hilarious accent) & G suddenly pretend to be a battling couple to throw off private detectives; in the second, Gable seems to suddenly (and brilliantly) turn the film into a drama when he convinces opportunist Roscoe Karns that he’s the leader of a kidnapping scheme. ‘IHON’ is in a group of films like ‘Bringing Up Baby’, ‘Roman Holiday’, etc., in which polar-opposite types face one difficulty after another before they finally realize they’re made for each other. That’s why the end of such films is always of less importance: we want to know just how intriguing the complications along the way will be. And, in ‘IHON’, they’re quite satisfying. While I wouldn’t go back to this as often as, say, ‘Bringing Up Baby’ (which I prefer for its sheer wackiness), I know I’ll go back to it again someday – and no doubt love it all over again.